HashTab provides OS extensions to calculate file hashes. 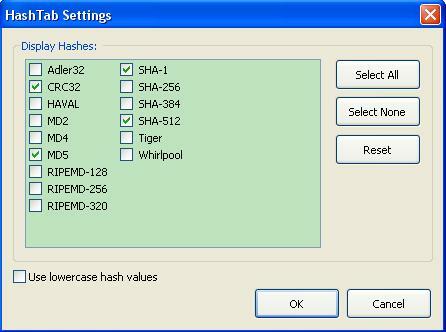 HashTab supports many hash algorithms such as MD5, SHA1, SHA2, RipeMD, HAVAL and Whirlpool. HashTab is supported as a Windows shell extension. HashTab provides an easy way to verify file integrity and authenticity. Tens of thousands have downloaded HashTab! Once you have installed HashTab, just right click on any file, select Properties and you will see a new "File Hashes" tab. "File Hashes" displays all the configured hashes for the file. Hashtab - free for personal private use. Program is XP and higher. Addon is for XP-32 bit only. You should mention that it's only for Windows XP and higher... definitely not "for Windows" as stated on the website. I personally prefer Febooti Hash & CRC. There is no mention it is "XP and higher" from their website. Even softpedia says "Windows All". I presumed you have tested in w2k (using the original installer of course) and it doesn't work or else care to share why you said "only for Windows XP and higher...". BTW, do you know how high it goes? I'm curious too. Febooti Hash & CRC doesn't seems it can compare hash. Or have I miss it? I know. This is what I call disinformation They say "For Windows" it doesn't work in Win2k and I'm sure it won't work on Win9x. I'm guessing it will work on all newer Windows starting from XP. There are some other utilities that can compare MD5 like this one which works even in Win95. Edit: By the way, they've got older versions available on http://www.winaddons.com/. this tool is slow. I'm using http://code.kliu.org/hashcheck/ but this requires XP and newer. Granted HashTab is not exactly fast. Then again, can HashCheck do all of these? @Geej - may I suggest you put in the description something like "And other File Hash Utilities"? Perhaps something like #1 ? It's definitely "for Windows" i.e. not OS/2 or VMS or Linux or BeOS or CP/M or whatever else. They didn't say "all versions of Windows", but either ways "XP and newer" (anything that's 10 years old or newer) covers ~99.9% of Windows users (market shares: Win2k 0.08%, NT 0.04%, win9x 0.01%) which IMO makes it good enough to claim that too. I mean, by some people's criterias here, even if it supported all the way down to Win9x, you could say it's not "for Windows" because it doesn't support all the way down to Win 3.x and even older (that's still Windows!) People who use operating systems that more than 10 years old and have a sub 0.1% market share have to deal with their choices, and they can't blame people for not adhering to their own personal definition of "all versions of Windows". You could say that "all" means "every common version" (that's good enough of a definition for most people really), or otherwise all the way from Win 1.01 (circa 1985) to Win8 (2012) which would be the the most "factual" definition (all of them are supported with zero exceptions -- not that it's physically possible due to 16/64 bit incompatibilities), but definitely not something in-between, hand picked by someone based on their own particular OS choice! Then again, can HashCheck do all of these? Is that a big determining factor? I mean, MD5 and SHA1 hashes are very common (enough to have written my own specialized tool to cover my specific needs), you sometimes see SHA2 (256), and CRC32 used to be popular (and is still used in sfv files) but the rest of them? I've never seen them used for checking file integrity ever. I wouldn't list this as much of a desired feature. If anything I'd say it's just visual clutter as it makes you look through too much text for almost no reason. I'd consider many other factors way before, like hashing speed, several key features (e.g. hashing entire folders at once, making lists of duplicate files based on hashes, how good the UI is, configuration options, import/export options, etc), how stable and bug-free it is, pricing, etc. There's one important point that the older versions of HashTab did support different (older) Windows (NT4.0 and 2K here to be specific). In such a case providing additional information that the new one doesn't is kind of logical, isn't it? They actually did it before. I can't understand why such information has been removed from the website. More than that, there isn't even any changelog available. there isn't even any changelog available.